Singapore-based real estate developers Pacific Star and DB2, through their joint-venture company Pearl Discovery Development Sdn Bhd, have signed a management agreement with Pan Pacific Hotels Group for the hotel chain owner to operate 205 luxury serviced suites under the “Pan Pacific” brand at Puteri Harbour, the crown jewel of Nusajaya, a major flagship zone in Iskandar Malaysia. Developed by Pearl Discovery, Pan Pacific Serviced Suites Puteri Harbour will offer studio, one- and two-bedroom apartments to cater to the needs of short- and extended-stay professionals and expatriates working in Iskandar. The 205 suites are scheduled to open in early 2018, when Pearl Discovery’s Puteri Cove Residences is completed. The only luxury waterfront development in Iskandar with both private-marina and sea views, Puteri Cove Residences will comprise three towers of premium apartments, four blocks of SOHO/loft units and a two-level waterfront retail promenade. 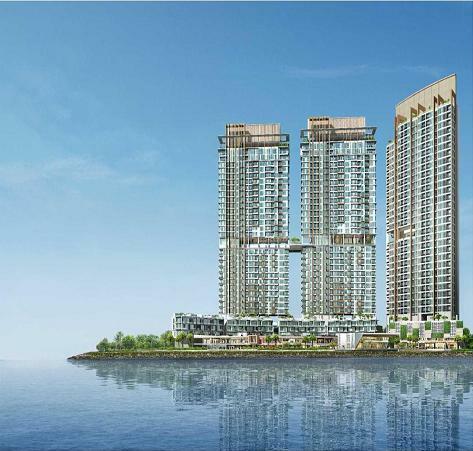 Pan Pacific Serviced Suites Puteri Harbour will occupy 16 floors within Tower 3. Puteri Cove Residences will overlook a private marina with more than 300 berths designed for the international boating community. The facility will be managed by Singapore’s award-winning Marina and lifestyle operator. Glen Chan, President and CEO of Pacific Star Development, said: “Partners, investors and buyers are increasingly discerning and are looking for well-located prime properties by developers they trust to deliver quality. This partnership underscores the confidence in our latest development Puteri Cove Residences and Quayside, which faces a private marina and is the only luxury waterfront project with both private-marina and sea views in Iskandar.” Puteri Harbour, Iskandar’s thriving new centre, is a 10-minute drive from Singapore via Tuas Second Link, and is close to major attractions and buildings, including Ascendas Nusajaya Tech Park, Pinewood Studios, Gleneagles Medini Hospital, EduCity and Legoland. It is also within a 5-minute walk from the Puteri Harbour International Ferry Terminal, which is planning daily ferry services to Singapore’s HarbourFront terminal. Datuk Ismail Ibrahim, CEO of Iskandar Regional Development Authority (IRDA), said: “We are extremely pleased to welcome ‘Pan Pacific’, a leading hospitality brand, to Iskandar, especially at a time when demand for premium accommodation in this part of Malaysia is going strong.” Optimism in demand for premium accommodation in Puteri Harbour, Nusajaya The collaboration between Pearl Discovery and Pan Pacific comes as more companies are setting up shop in Iskandar. IRDA disclosed in September that at least three theme park operators – from Japan, North America, Europe and Australia – are expected to open attractions in Iskandar. The theme park projects will be part of the RM30 billion of committed investments IRDA has targeted for 2015. Investors, especially those in the manufacturing industry, are also actively seeking out space in Iskandar. Johor remains Malaysia’s top investment destination for manufacturers, attracting RM27 billion in investments between January and June this year compared to RM21 billion for the whole of 2014. Attracted by lower business costs in Johor, many industrial property users are multinationals from Europe and companies from Singapore. Ascendas Nusajaya Techpark in Gerbang Nusajaya also recently announced a joint venture with Mitsui & Co, one of Japan’s leading conglomerates, to bring in quality Japanese industrial tenants as part of its phase 2 developments. In the longer term, several major projects will continue to underpin demand for real estate in Nusajaya. Nusajaya, where the Pan Pacific Serviced Suites Puteri Harbour is located, will be easily connected to the rest of the country and Singapore when the Singapore-Kuala Lumpur high-speed rail link is established as it is one of seven stops in Malaysia identified for the rail. Existing attractions in Nusajaya include Puteri Harbour Marina, Legoland, Hello Kitty Town and the Mall of Medini. Pan Pacific Serviced Suites Puteri Harbour marks the latest collaboration between Pan Pacific and Pacific Star following the successful opening of Pan Pacific Serviced Suites Bangkok in 2010. Some 80% of the Bangkok property, developed by Pacific Star and operated by Pan Pacific, was pre-leased just six months after its opening. This entry was posted in Iskandar Information and tagged Pan Pacific Hotel, Puteri Cove. Bookmark the permalink.